Bloom's does a lot of things, but mostly it is a very practical tool for writing learning objectives. If you want to create content and assignments and assessments that achieve the desired end, you need to carefully define the desired end. Enter Bloom's. Evaluation: I can make an informed critical judgment about it. The graphic below illustrates the modified version by Anderson and Krathwohl. Click on the image to see the whole thing (or for an interactive version that is actually quite fun, go here to the Iowa State site). This diagram is not nearly so complex as it may at first seem. 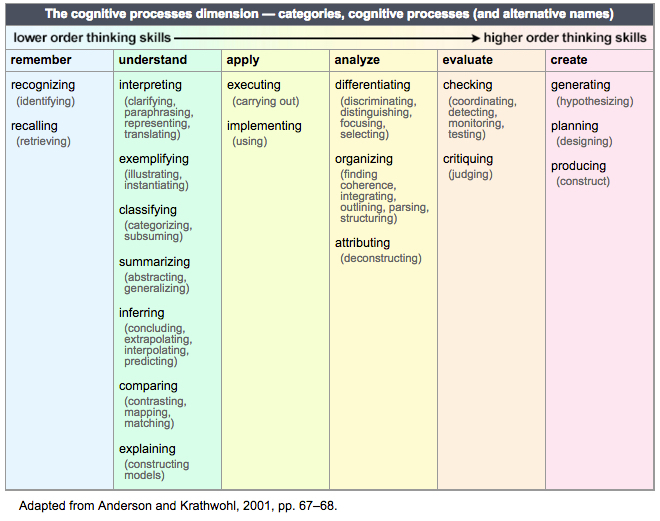 The idea is to write your learning objectives starting with your content type on the left ("Knowledge Dimension") and then finding the appropriate level of critical thinking on the right ("Cognitive Process Dimension"). 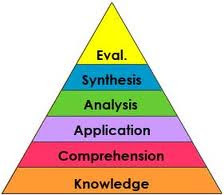 The Cognitive side is the old Bloom's pyramid, but with Synthesis dropped (actually folded into Analysis) and "Create" added as the highest level. Your course, lesson, elearning product, and/or assessment will naturally benefit from a little careful planning around learning objectives. Bloom's is a tool to help you get the right objective on a logical scale, from simple to complex. Nothing on my list is more tried and true. Benjamin Bloom chaired the committee that first developed the model, which was published in 1956. Pretty much everybody's been using it since. The updated version by Anderson and Krathwohl was created in 2000. The update is an improvement, and that is not controversial. Krathwohl actually worked with Bloom back in the 1960's. I think of Bloom's as a place to shop for active verbs. "At the end of the lesson, the learner will be able to VERB something." So in my practical way of thinking, Bloom's is a thesaurus for writing objectives. The lesson might require little or no critical thinking ("recite"), or it might require a lot ("analyze"). Get the right verb in the objective, use that verb when you design activities and assessments, and you can prove, and improve, learning outcomes. Above is one list of verbs, from the same site as the previous image. There are many other lists directly linked to a search engine near you. Find a verb, use it, done. I've found verbs, used them, and included Bloom's in development processes for courses, programs, seminars, workshops, videos, workbooks, you name it. Constructing learning objectives is actually a very small part of learning-product development, because it's so easily done and takes so very little time. But it's arguably the most critical part, because it's the seed from which learning success ultimately grows. So you need to do it well. And Bloom's is a critical asset for doing it well.